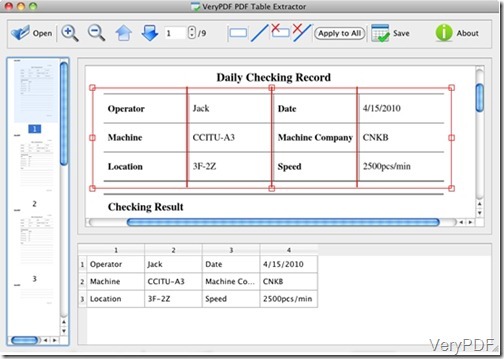 PDF Table Extractor for Mac is designed to export the PDF table data to Excel work sheet files on Mac computer.With this software, users can save the exported PDF table data into Excel(.xls) and Comma-Seperated Values(.csv) files.Besides, users can designe the table columns according to their own needs and then save the exported table data to Excel and CSV files. Therefore, users can export the PDF table data into the Excel work sheet and CSV easily and professionally. 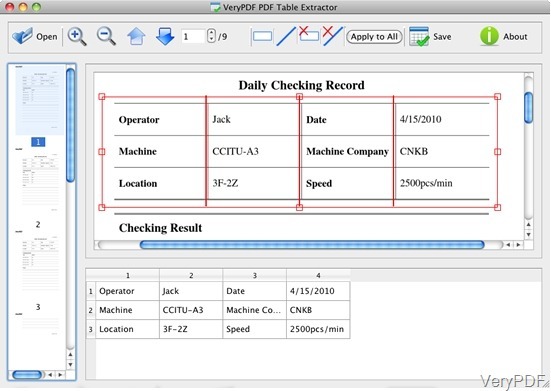 With the help of PDF Table Extractor for Mac, export PDF table to Excel sheet turns to be a simple stuff. Now in this article the method will be told on how to export PDF table into Excel Sheet. Click the button”open”on the upper-left part of the interface and put the PDF files into the interface, they will be shown on the left side of the interface and the current page will be displayed on the central part of the interface. With the“Up” and “Down”arrow buttons , users can preview the previous and the following page of the PDf files. If we want to zoom in and out the PDF pages, these two buttons can be used: . Specify the table area before exporting the content of PDF files with the button . Draw a rectangle on the PDF page and the converted areas will be extracted and previewed in a work sheet format on the lower part of the interface. Then Click the button and put the mouse cursor on the top or bottom border line of the rectangle, press the left button of the mouse and draw a vertical line when the mouse cursor become a cross”+”. Then the text will be divided into seperate columns by the vertical lines and exported into diiferent columns in the lower panel in the center. To add a blank column, please draw two vertical lines and make sure there is no text between the two lines. If you want to remove the tables or selected lines, please click the buttons .Click the button “Apply to All”can help apply the column division settings to all other pages of the PDF files. Click the button”Save” when you determine the table content and columns,then choose Excel or CSV in the Save File dialog and save the file. Now the exported PDF tables have been saved in Excel sheet files. If you are in trouble with such problem, do not need to worry about and download the free trial version and experience the advangtages of this software. How to convert PowerPoint to Postscript?